Owning a business is a fun way to make money while being your own boss, but if you are a business owner who employs other people it is a good idea to be aware of what can go wrong when an employee is injured. While it may seem overwhelming when it is happening, knowing what you’re responsible for when an employee is injured will help make the process easier to understand and get through when the time comes. Most times, when an employee is injured while on the job the fault is almost completely the employers. Employees are expected to be aware of situations and not neglect safety procedures, and employers must make sure that their employees are doing this. An injury that was caused on the job is almost always the employer’s fault. While you as a business owner are responsible for this, you’ll want to make sure you have the proper defenses in place to save you as much money as possible. Having a lawyer like Bronson Jones & Co on call would be a good idea for any business owner. When an employee is injured on the job and requires medical attention, it is the responsibility of the employer to get the employee this attention. While it may seem like a big burden, worker’s compensation insurance generally covers any medical visits the employee must make and will not always come directly out of the employer’s pocket. If an injury that was sustained on the job continues to be a problem for the employee and causes them to miss work, the employer is responsible for paying the income that they are missing out on due to the injury. 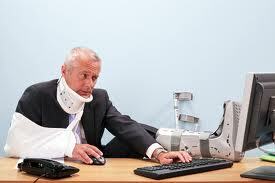 Since a workplace injury is not the fault of the employee, they can not help that they are not working. It is the fault of the employer, and the employer is almost always expected to pay compensation that is comparable to what the employee was making before the injury occurred. Many employees that obtain an attorney for their workplace sustained injury will claim that they have suffered and had unnecessary pain due to the injury. This is remedied by the employer paying a pain and suffering sum that will help the employee deal with the injury in a more efficient way. Pain and suffering, like medical and missed income payments, are generally covered by workman’s compensation insurances. While you are helping the employee through their workplace injury through monetary, it is also your responsibility to make sure that you retain the employee after the injury. Doing so will be much less of a hassle for you as an employer in the long run.